The Panasonic Lumix DMC-FT5 (also known as the DMC-TS5) is a waterproof, shockproof, freezeproof and dustproof compact digital camera. The Panasonic FT5 can be used underwater to a depth of 13m, is shockproof from a height of 2m, freezeproof to -10 degrees C and and pressure resistant to 100kg. In addition, the 16 megapixel Panasonic FT5 offers a 28mm wide-angle 4.6x optical zoom lens, 1920x1080 full-HD movie recording, Wi-Fi and NFC connectivity, an on-board GPS module, a compass, altimeter and even a barometer. 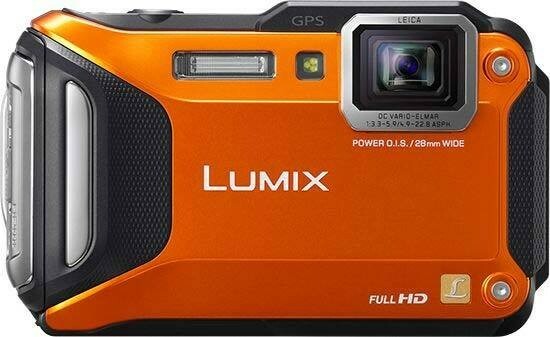 The Panasonic Lumix DMC-FT5 / TS3 is available in black, blue, white or orange and costs £349.99 / $399.99. The Panasonic Lumix DMC-FT5 follows on from last year's FT4, and the FT3, FT2 and FT1 models before that. Like its forebears it is fashioned in the rugged style of a workman's toolbox miniaturized and with a lens attached, and is available in a range of four colours. Dimensions are 109.2x67.4x28.9mm, slightly larger than its predecessor, so it's still barely wider than your non-armoured compact, while a weight of 214g with battery and optional SD card loaded ensures it can be comfortably transported in a trouser pocket. The FT5 / TS5 features GPS for the location tagging of images, a feature retained from its predecessor. This provides real-time information naming the location at which your shot is being taken, with, claims Panasonic, up to a million landmarks stored. It's one of the more precise GPS antennae we've seen on a digital compact, being able to pin down our location within a borough rather than simply flagging up the wider area. And, unusually, we didn't experience the usual problems of getting it to work when we were indoors as well as outside. Longitude and latitude coordinates are stored in the particular JPEG image's Exif data. The GPS also allows you to automatically record your location and view the map and associated photos directly on your camera, rather than having to wait until you get home and download onto a PC. The Panasonic Lumix DMC-FT5 can withstand being dunked underwater to a depth of 13 metres and still come up functioning, while it can survive a fall from two metres in height. The FT5 model also retains the previous camera's ability to be used in temperatures as low as -10°C, and the fact that it's dustproof – which again was a capability introduced way back on the FT1. Like Olympus Tough models, it's now also crushproof, to 100kg to be precise. Though like its predecessors you can't, for the most part, fault the build quality, our gripes continue to include the fact that, with the exception of the main shutter release button, all of the controls are too small and fiddly to be operated accurately with either wet fingers or while wearing gloves (unless of the fingerless variety!). It seems that Panasonic would rather retain a modicum of style than give wholly in to practicality, perhaps mindful of the danger of ending up with something less stylish if image quality and usability is placed higher in priority than creating something that simply looks good. Such 'compromise' also means that the FT5 retains folded optics, so at no point does the optically image stabilised 4.6x zoom emerge from the body and into harm's way if dropped. Protected by reinforced glass in lieu of an automatic lens cover, the Leica-branded lens offers an adequate focal range of 28-128mm in 35mm terms. We did notice some drop off of focus towards the corners of the frame at maximum wide angle, while as with most pocket compacts offering more than the old 3x capability, results are softer the closer you get to maximum zoom setting, plus there's the option to let the zoom run on and extend it digitally to an equivalent 9.3x. A narrow window for the integral flash, plus self-timer/AF assist light indicator are set alongside the lens. Thankfully the flash is set far enough away from the camera's edge to avoid fingers obscuring it. There is a subtly raised rubberised portion to the front which acts as a grip, although there's no similar area on the rear, instead you find your thumb resting on and obscuring the wi-fi lamp. Press the FT5's power button and the camera readies itself for image capture in under two seconds, initially presenting users with the on-screen offer of a tour of the precautions to bear in mind if using the camera underwater, so you're always mindful of accidentally trashing the camera. A half press of the shutter release dissolves this message if you're on dry land and just want to get on with the business of taking a shot. Press down fully to take a photo and, with no discernible shutter delay, a full resolution JPEG is committed to memory in 2-3 seconds, the screen briefly displaying a frozen image of the captured shot. Like its FT4 forebear it's certainly as quick as anyone would want from what at the end of the day is a point and shoot pocket camera. With images framed and reviewed via the bigger and higher resolution 3-inch, 460k dot resolution LCD screen, commendably, video clips here are the Full HD 1920x1080 pixels, with a dedicated record button provided alongside the shutter release button to commence their capture – no matter what alternative stills mode might be in play. There is also a choice of two formats: the highly compressed AVCHD or the less tightly squeezed MP4 for wider compatibility. The useful wind cut feature remains for making recordings, as does continuous auto focus, and the fact that the optical zoom can be accessed for video as well as stills. There's no traditional bottle-top style mode dial here for alternative stills selections – indeed the control layout at the rear is very similar to that of the FT4 in its streamlined appearance – whereby a mode button is provided instead, a press of which brings up the shooting options as two rows of icons presented centre of screen. These are then tabbed through and selected via four-way command pad with familiar 'menu/set' button located at its centre as you'd expect, a press of which selects whichever setting is highlighted upon. Here the ten shooting settings are laid over the image in front of the lens so you don't lose sight of your subject whilst adjusting settings. As well as the familiar scene and subject-recognising intelligent Auto (iA) setting, we get a Program mode, a manual mode which allows the adjustment of aperture and shutter speed - plus Sports, Snow and separate Beach and Snorkeling modes by way of indicating how Panasonic imagines this camera might be used. Next up are separate Advanced Underwater and Panaorama Shot modes, with the former automatically compensating for the red color which is easily lost in underwater shooting. The Panasonic Lumix DMC-FT5 has an extensive range of Creative Controls, denoted by an artist's palette in the shooting mode menu, with 14 different options on offer. The 16 pre-optimised scene modes cover the usual range of portrait and landscape photo biased subjects plus the now merely ubiquitous 3D mode. As with the FT4, on the FT5 this 3D feature again recalls the Sweep Panorama feature of the Sony Cyber-shot and NEX compacts by compositing an image from a sequence of shots taken as you pan with the camera in the direction the on-screen arrow indicates (left to right), through an arc of just 10cm or 0.33 feet. Like competing models, the file generated by the Lumix DMC-FT5 is an MPO file. So this isn't actually viewable in all its stereoscopic glory unless you own a 3D TV – although a Fine or Normal quality JPEG is saved alongside the MPO file for easy reference. However it really is for reference only as the quality is akin to a grab from a video sequence rather than a dedicated still, and delivers a file size of only around 1MB. Staying at the back and directing our attention to the top right hand corner, the camera's zoom is now operated by a familiar rocker switch which is much easier to use with slippery, wet fingers. With the camera's lens at its widest setting from the off, a press of the right hand (telephoto) button and its travels through the focal range slowly but steadily and moreover nigh silently, in around three seconds. The zoom can also be utilized when recording video clips, but slows down further to avoid mechanical noise being a distraction, taking around five seconds to get from wide to tele setting. Underneath the zoom rocker is the self-explanatory Playback button, the previously mentioned Mode button, and the new wi-fi button and indicator lamp. The built-in Wi-Fi functionality (IEEE 802.11 b/g/n) lets you use your smartphone or mobile device to remotely change the camera settings (focus setting, exposure compensation, ISO, WB and Photo Styles) using the LUMIX App. You can even operate the zoom and fire the shutter button remotely, while the auto transfer function automatically backs up your photos onto a tablet, smartphone, PC, web service, AV device or Panasonic's LUMIX Club Cloud Sync service. The DMC-FT5 is also one of the first cameras to feature NFC (Near Field Communication) technology (the same technology that's used for mobile payments), which allows you to connect it to a compatible internet enabled device or another NFC-enabled camera by simply tapping them together. The regulation issue four-way control pad/cross key set up meanwhile features the same layout as the FT4. So at 12 o'clock we have a means of tweaking exposure compensation (again +/- 2EV with an on-screen slide bar provided) if you're not in iA mode that is, which disables access to certain functions including this one. Then, as we move around clockwise we find a means of adjusting flash options (auto, auto with red eye reduction, forced flash on, slow sync flash with red eye reduction and flash off), then selecting macro setting for close ups (as close as 5cm) and/or self timer (an option of two or ten second countdowns). A press of the centrally located menu/set button meanwhile brings up 5 icon-distinguished folders on screen, including a dedicated one for GPS functionality and the new Wi-Fi options. We also get the regulars of still image capture – the 'record' mode – plus a separate one video recording, and the equally self-explanatory option of 'set up'. The contents of the photo record folder are split across five screens if you have the camera in Program shooting mode and run the gamut of picture quality and size settings along with the ability to adjust aspect ratio from 4:3 to 3:2 to 16:9, and, more unusually on to 1:1. We also get intelligent ISO among the ISO settings, and the ability here to select incremental stages from ISO100 up to ISO3200 as one would normally, which is a fairly modest range as previously mentioned. White balance can also be adjusted manually, whilst AF mode can be swapped from the default 1-area AF to 23-area, or to spot AF, or by AF tracking, as well as to face detection mode if you're going to be taking portraits in the main. It's within the record folders that we also find the colour mode options, which are rather squirreled away as a result, plus remain unchanged from the old FT1. Colour can therefore be altered from the default of 'standard' to vivid, B&W or sepia. Dipping next into the video recording folder we find a screens' worth of options and again the ability to adjust quality dependant on end use and swap between AVCHD and Motion JPEG compression options. It's here that as we mentioned earlier users can deploy the wind cutting option when filming video outdoors, as well as activating continuous AF so the shot doesn't go totally out of focus as you gradually adjust framing. The third folder as indicated pertains to the use of GPS. This can be set to be constantly active (a lamp therefore glowing on the camera even when it is otherwise inactive), turned off entirely, or placed in 'airplane mode', whereby the GPS only kicks in when the camera is switched on, rather than keeping working while it's off. You can also re-position/refresh the GPS settings, plus manually set the compass by perform a bizarre figure eight 'dance' with the camera. An impressive array of functionality is therefore included here. The set up icon/folder meanwhile provides access to eight screens' worth of options and it's here that we get to turn a histogram on/off or call up a nine zone compositional grid on screen, as well as set date, time, and format the internal memory or card in use. The remaining two buttons at the bottom of the camera back are for the self-explanatory display and the less immediately obvious 'Q.Menu'. A press of the latter 'Quick Menu' option brings up a toolbar across the top of the LCD screen, allowing the user to quickly tab through options for adjusting the likes of GPS mode, AF mode, burst shooting (maximum 10fps at three megapixels) white balance, ISO, still and video resolution/quality as well as adjusting the LED light and monitor brightness. Basically, these are your key settings at a glance, saving the time required to dip into the menu folders previously discussed. Subsequent presses of 'display' meanwhile turn off the otherwise constant onscreen icons and shooting info to provide an image clear of distractions, and/or call up a nine zone compositional grid on screen for those users practicing their rule of thirds, or, more funky still, a graphical interface of GPS coordinates and compass, which adjusts automatically as you tilt the camera itself. On the right hand flank of the FT5, if still viewing it from the back, there's not only a sliding catch on the side door protecting the joint battery and SD/SDHC/SDXC card compartment, plus HDMI and USB outputs, but also an additional lock to prevent any ingress of undesirables. On-screen prompts and warnings also lessen the prospect of accidents or jumping into the pool without doing the equivalent of battening down the hatches first. Also located over at the far right hand edge – which curves around to 'bleed' into the top plate – is a lug for attaching a provided wrist strap. Incidentally according to CIPA testing, battery life is good for 370 shots from a full charge, a big increases on the the FT4's 310. The base of the FT5 meanwhile features the familiar slightly off-centre plastic screw thread for attaching the camera to a tripod, and that's your lot as regards features and functionality.